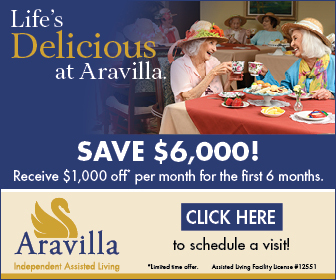 In Aravilla’s vibrant senior living communities, leisure, laughter, and new adventures always await. Our busy and diverse activity schedules encourage you to embrace your individualism with dozens of options, from live music and entertainment in our piano bars to group exercise and art. Enrichment classes promote continuous personal growth. There is much to do in the surrounding area as well, with frequent day and evening excursions to local beaches, shops, sporting events, art and theater productions, and more. Aravilla is also a peaceful, relaxing place to enjoy the comforts of home. You can curl up with a book and a beverage in your favorite spot, or take your dog for a stroll in our assisted living communities. When you want serious relaxation or quiet time, our picturesque ponds and lagoon aqua-therapy pools are ideal. With lots of events for your family and friends to attend, you’ll also have the chance to spend quality time with the people you love. Aravilla Sarasota is drinking Lunchtime at Popi's Place at Lockwood. Residents went to Venice pier this week!